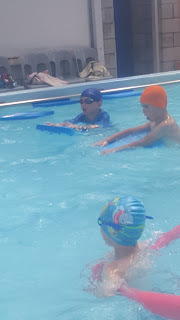 Room 11 Swimming Kia Ora Room 11 Whanau, We hope you enjoy these photos of your children building up their confidence and water skills. So many schools no longer have a pool but we are very fortunate to enjoy this facility here at Trentham. Many thanks to those parents who have been able to help the children enjoy their swimming time. Lee, Sarah and Kirsty. Room 11 is on line. Keep an eye out for more interesting news!